Lesson notes can be added when a lesson is completed in the Teachworks calendar. You can add Internal Notes and/or Shared notes. Internal notes for office use only and will never be visible to your clients. 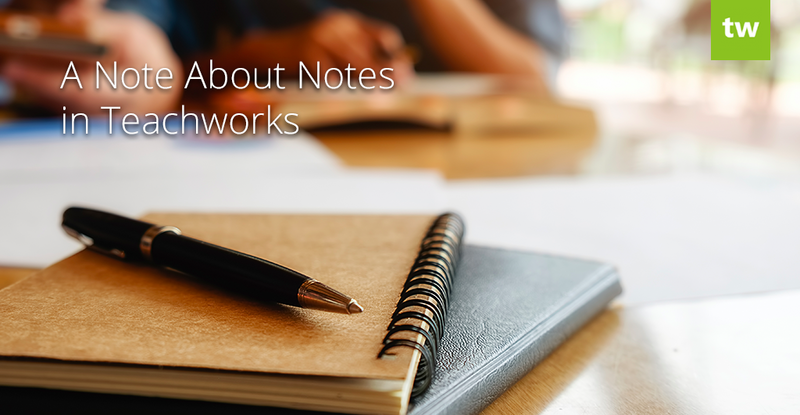 Shared notes are visible to families and students and can easily be emailed if you have the Lesson Notes option enabled on their profiles. Lesson notes are related to specific lessons, so you can use these fields to capture any information relevant to the lesson. For example, if the lesson is for a child student, you can write some feedback in the Shared Notes field and send this to the student’s parents. If a student is late for a lesson, you can add an internal note to keep a record of it. If you follow a strict layout when compiling lesson notes, you can speed up the process by adding the relevant headings in this field. When the lesson is completed by you or a teacher (if they have permission to complete lessons), these headings will be pre-filled and they can just complete the rest of the notes. If you’d like to add more general notes to client profiles that are not really related to individual lessons, you can use our Note & Communication Logs Add-On. This handy add-on allows you to add notes directly to client profiles. You can view notes in bulk by going to the family or student list page in your Teachworks account and then clicking on the “Profile Notes” link in the sidebar. If you’d like to follow up with your clients at a later time, you can use this add-on to add a follow up date and note to client profiles. These can easily be tracked by going to the student or family list. If a follow up note has been added to a client’s profile, the follow up date will be displayed in the “Follow Up” column and you can click the date to view, edit, or delete the follow up note. If you’d like to share lengthy notes with your clients or employees, you can attach documents directly to their profile with our Profile Attachments Add-On. They can then login to their Teachworks account and easily access these resources.